I am not feeling very chatty today. I am running low on sleep and patience. We have a sick kiddo in the house and while he might be responsible for the lack of sleep, it is the other Little Men who are responsible for the lack of patience. Man, it isn't even Halloween yet either. They really haven't had any sweets yet, so I am trying to figure out why they are being so very special right now. There is lots of crying, whining, and complaining. You know that moment when you are being bellowed at from multiple children all yelling "MOM!" and everyone thinks there catastrophe it by far the most important? That is what it is like around here today. I kind of want to yell "MOM" back and see what happens. I am pretty sure it will just add one more voice to the chorus. It might make me feel better though. 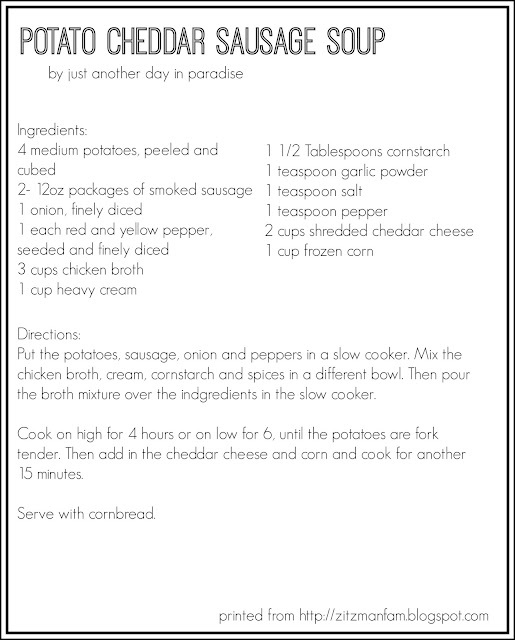 A couple of wees ago, I made this, what I am deeming The BEST Cornbread, to go with our Potato Cheddar Sausage Soup. I am really wishing it was yesterday so that I could have a big old slice slathered with butter. 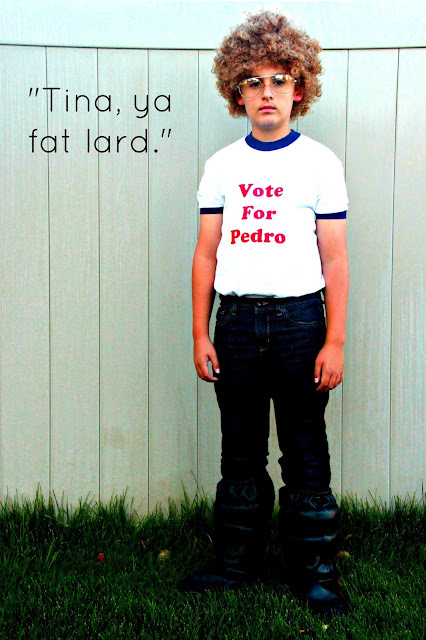 I feel like cornbread right now. Well I feel like any good and therapeutic chunk of warm carbohydrate. Bread fixes everything. Well, I guess unless you are gluten intolerant and then it is the problem. But for me bread fixes everything. And I could sure use some today. 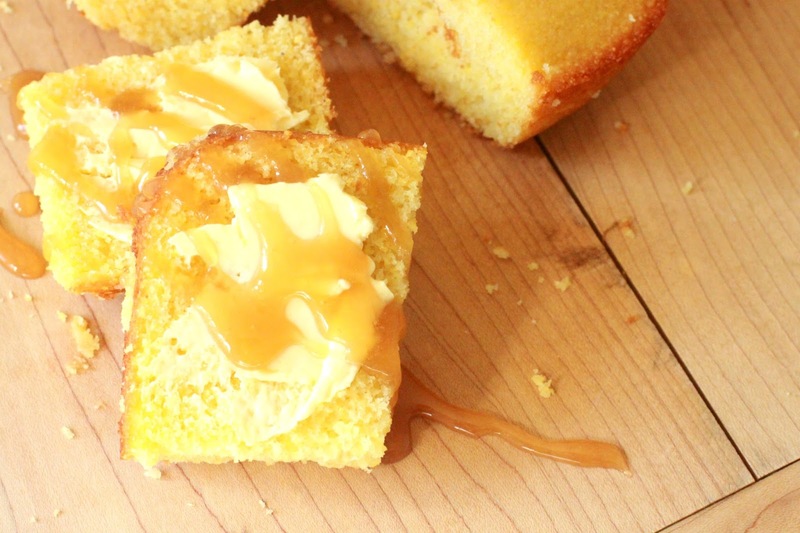 I highly recommend trying this cornbread out. The reason I dubbed it "THE BEST" is because I have tried tons of cornbread recipes out over our 14 years of marriage. I always come away with an "eh". I never hate them, but I never love them enough to use the same recipe again. The search has ended. This is the bread. 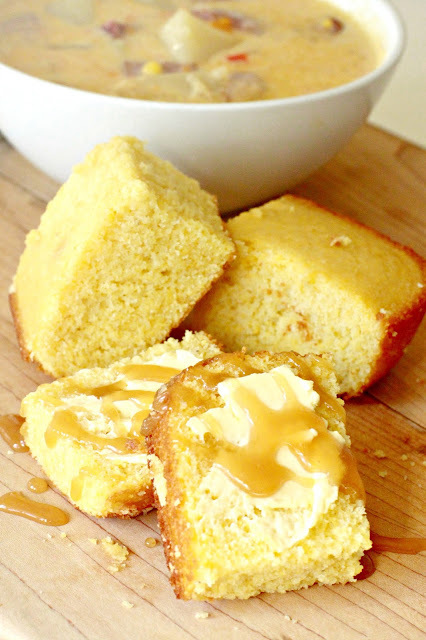 I will use this cornbread forevermore. It is that good. Hence the me wanting it to fix my bad day. Here is to better days full of less whining, from both the kids and me! 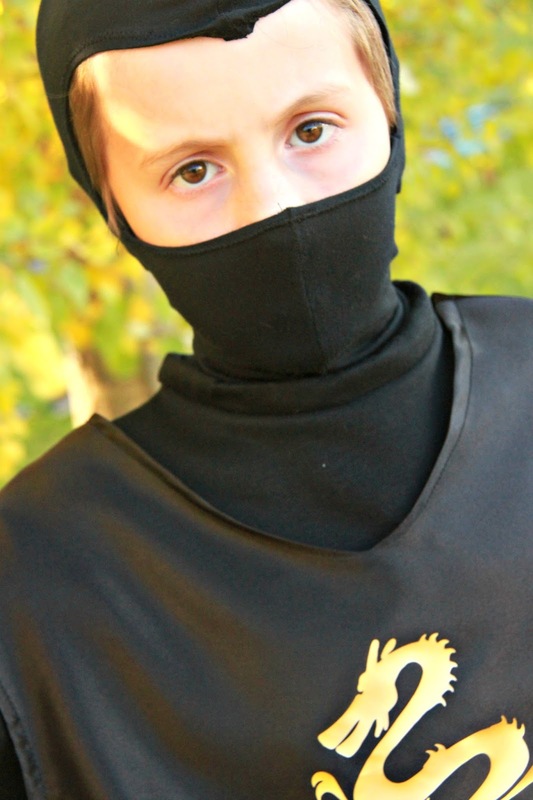 Here is our family Ninja. This costume came about for one reason and one reason only. He wanted two swords. Ninja swords to be exact. 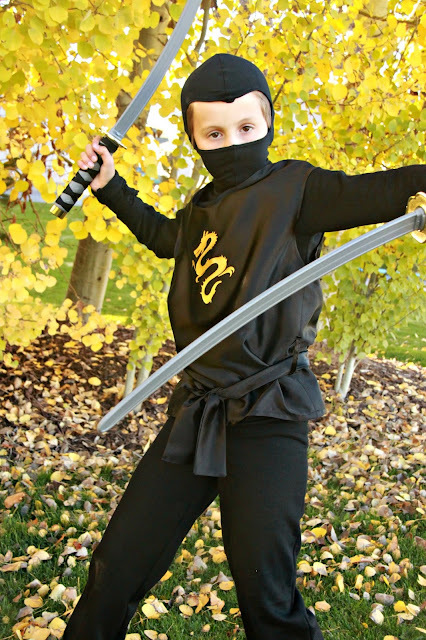 Once it was decided he could be a ninja and have two swords, he also decided that it was important that he wear all black. 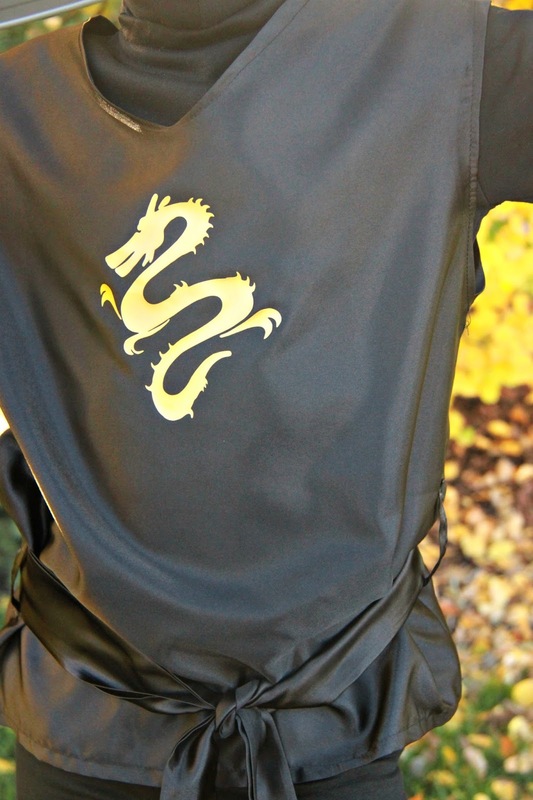 I made an executive decision to put on this gold dragon. Turns out he was okay with wearing all black with just a touch of gold. Whew. 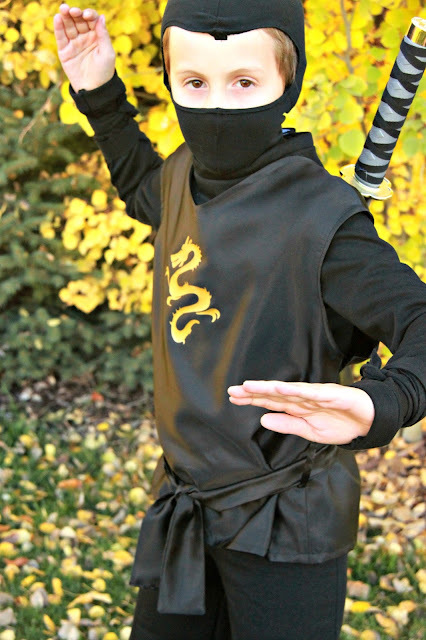 I drafted and made this costume up with no pattern. I used three different types of fabric. 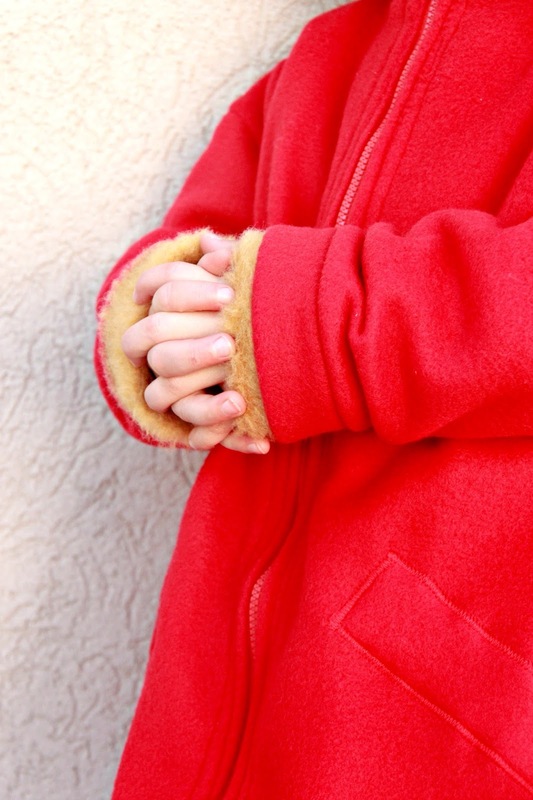 I used a knit, a sweatshirt jersey, and a rayon satin. I used the sweatshirt for the shirt and the pants. I used the knit for the mask. The satin was the sheath. 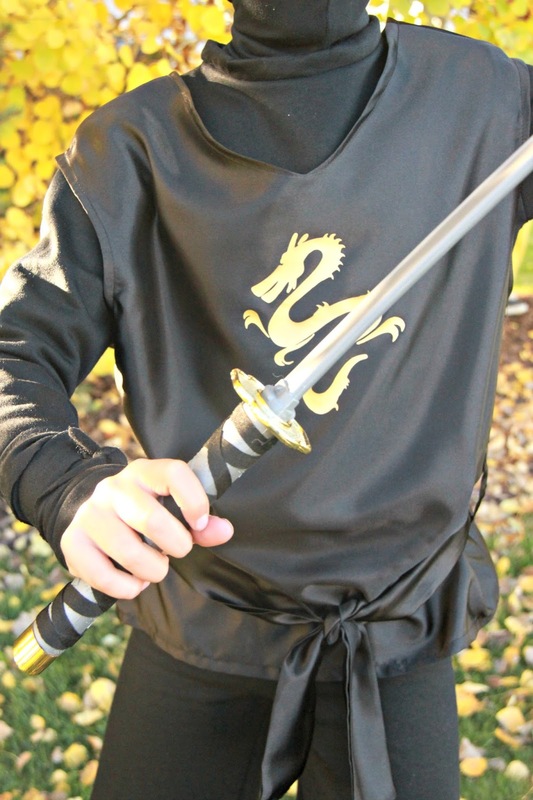 This ninja is pretty happy with his new threads. 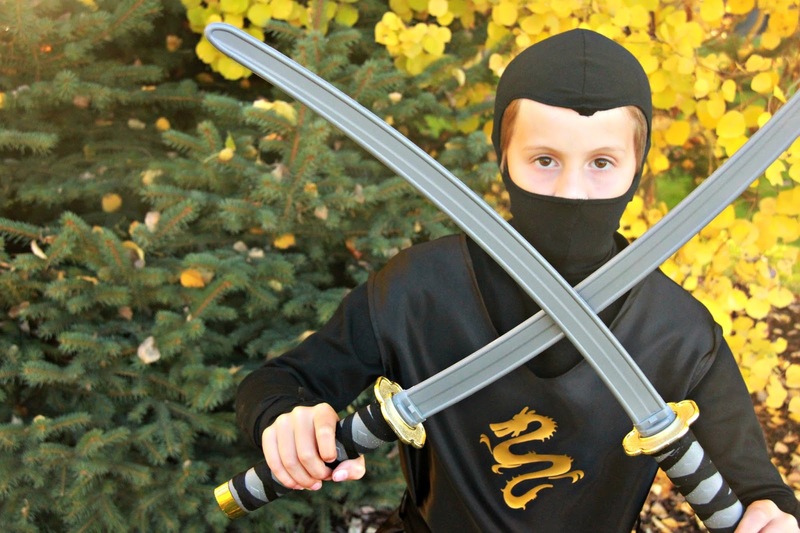 He was all ready for some ninjaing. That is totally a word by the way. He has already taken his costume for a test run and it kept him fairly warm and got him lots of candy. Win. Win. The last costume of 2015 will be up tomorrow. So exciting. 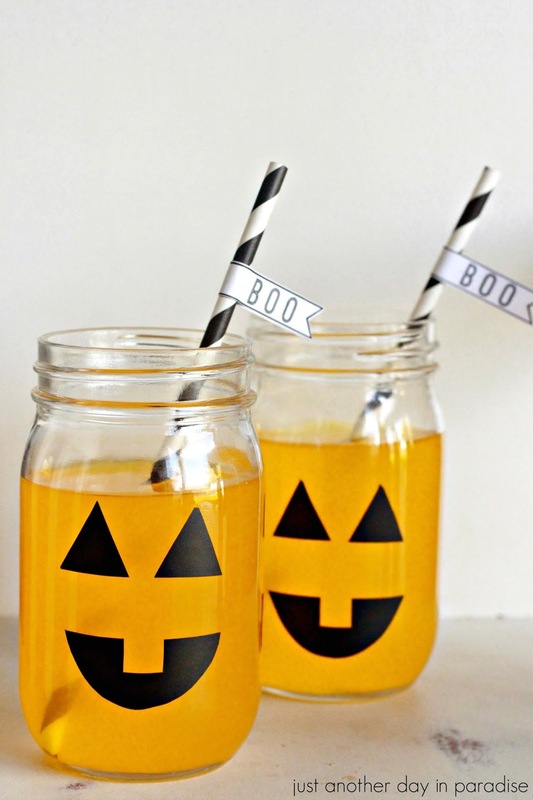 Halloween is in four days. 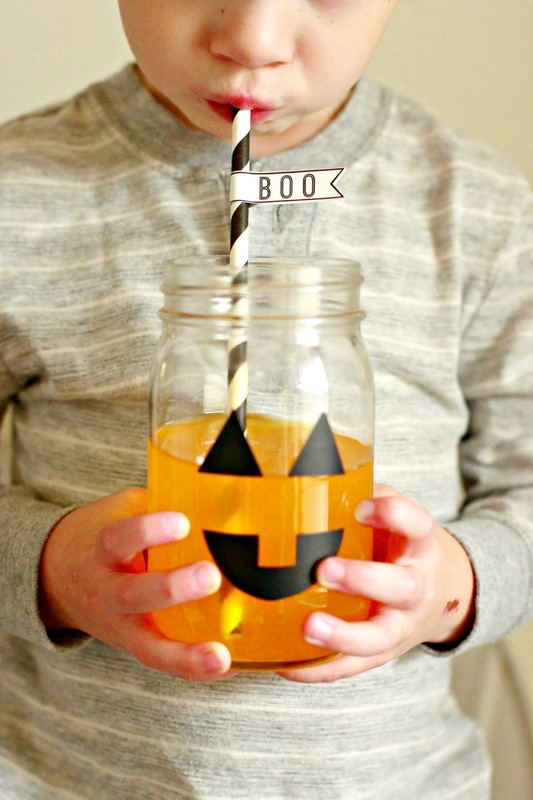 Want a fun and easy Halloween project? Slap some vinyl on a mason jar, of course in a jack-o-lantern style. 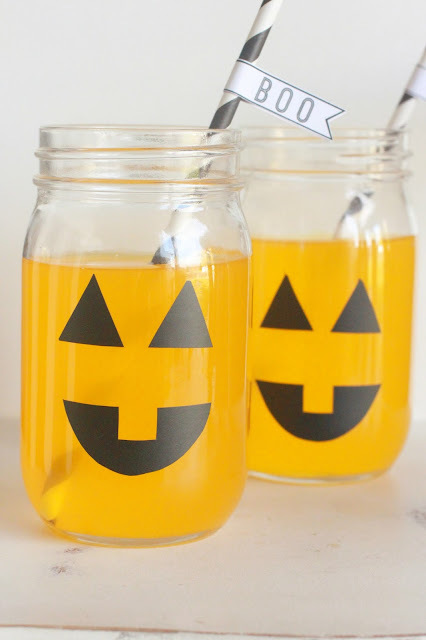 Pour a little orange drink into said jar. 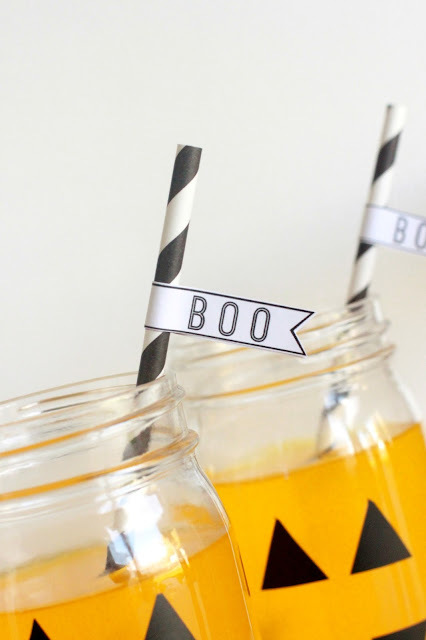 For an extra bit of fun add a paper straw topped with this really cute and simple BOO banner. Seriously the only work of this whole thing was cutting out the banner and gluing it onto the straw, and let's be honest that wasn't really work. Our special orange drink was a half and half combination of mango Powerade and Fresca. I was told it was the best drink ever. Then add it to a straw to an orange drink and HAPPY HALLOWEEN! I have a secret. A hang-your-head kind of secret. I was a super duper lazy loaf of a kid. Like I had the Disney Toon Afternoon schedule down. If I had the choice to go outside and play or stay inside and watch TV or read a book, then I always chose inside with my favorite show or book. I didn't fully appreciate being active until I was in middle school. I joined the volleyball team. I got involved in some after school activities, which weaned me off of Disney Toon Afternoon (which at my age I should have already done, but alas who can help but loving Gummy Bears or Duck Tales). Once I caught the active lifestyle bug, I was hooked. I love being active. A healthy active lifestyle is such an important thing to have. I decided as a young parent that I wanted my kids to love being healthy and active as much as I do. 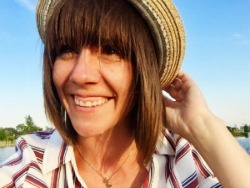 Now I am a not-so-young parent of four boys. Encouraging kids to be active can be challenging and not as easy as I thought it would be. I have learned a couple of things, and I am sure I have many things to still learn. However, I want to share some things I have learned over the years. 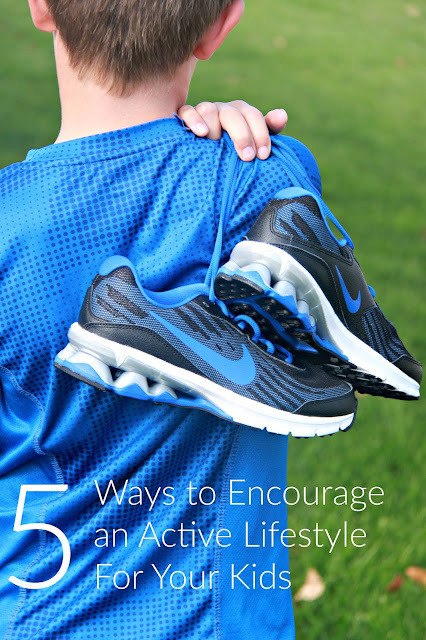 Here are 5 Ways to Encourage an Active Lifestyle For Your Kids. 1. Limit Video Games and TV Time. My kids could quite possibly spend every minute between getting home from school and going to bed watching TV and playing video games. One of the best things we have done as parents is to limit video games and TV. Most importantly, video games. We allow video games to be played only two days a week. For us that is Friday and Saturday. There are rules set in order for them to play video games on the given day. One of them is outside time. Get your kiddos outside. Whether it is in your yard, at the park, or on a walk. We have even taken our kids to a nearby elementary school to play. Have balls, bikes, or scooters available. My boys love to play football with each other and with friends. They also LOVE their bikes. Worried about weather? We live somewhere pretty chilly, but we still find ways to go outside during the winter. Not every day. In fact, sometimes it is just once a week. Encouraging them to bundle up in their snow gear and build a snowman (okay who am I kidding they are getting in a snowball fight) will help keep the habit alive. There are so many options to going outside. Sometimes it might take a sacrifice, but having your kids learn to choose outside instead of inside will keep them playing and moving. 3. Sign them up for sports. My kids aren't naturally athletic. However, we have them sign up for a variety of sports and activities. We have them try lots of things. There are so many activities/sports available for kids to play at almost any age. There are the traditional team sports like baseball, soccer, football and basketball. There are individual sports like running, swimming, and golf. There is dance, karate, and gymnastics. Sports are great because they give kids goals. They have practices that keep them active. Right now we allow our kids to try a variety to allow them to discover what activities they like the most. Playing sports give the kiddos a way to stay active that I don't have to monitor. They have coaches, teams, and practices. Encouraging your kids to be active is easier if they see you being active. Go on a walk around the neighborhood together. Do a race together. They have so many family friendly low key races. My boys and I got to do a really fun 1 mile mud run and obstacle course this Summer. Watching my boys run, climb, and crawl through that race. My boys have done Insanity with me. My husband goes out back and plays football with our boys. We go on bike rides. If you like hiking, take your kiddos. Find something active you can do as a family. If you are active, your kids will be too. A couple of summers ago, one of my boys was playing big kid baseball for the first time. We got him ready for the baseball season by buying him baseball pants, shoes, a mitt, and a baseball hat. NONE of it was fancy, but it was perfect. We talked about if he dressed the part then he would try hard and play like a real baseball player. Over the last several years I have used that same train of thought with getting my kids to want to be active. I let them pick out shorts, shirts, and even some of those super cool tall socks. We watch for sales and we get basics. It makes my kids more invested in being active. Another important investment is shoes. 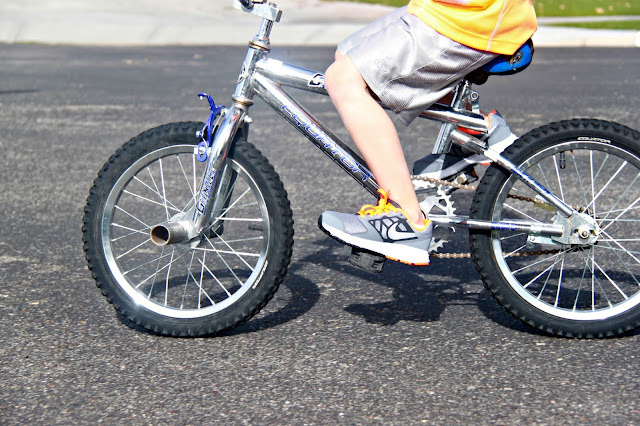 Since my kids play a variety of sports, I buy my boys a nice pair of running shoes or cross-trainers that they can use in multiple activities. When they have good shoes they want run faster. Good shoes also last longer and wear better. I have tried buying inexpensive shoes. 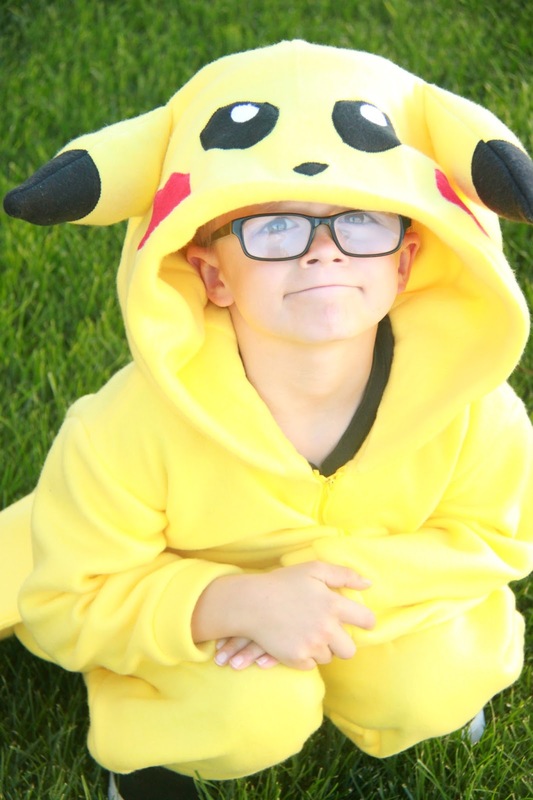 They always wear out really fast and are not comfortable for my boys to wear. My boys' new favorite shoes are these Nikes. I was able to find all four of my boys great pairs of Nikes, ALL on sale too, at JCPenney's. I have talked about my love for JCPenney before. JCP has an incredible selection of Active Lifestyle products for the whole family. My boys had the hardest time picking out which shoes they were going to get. There were just SO many to choose from, especially online. 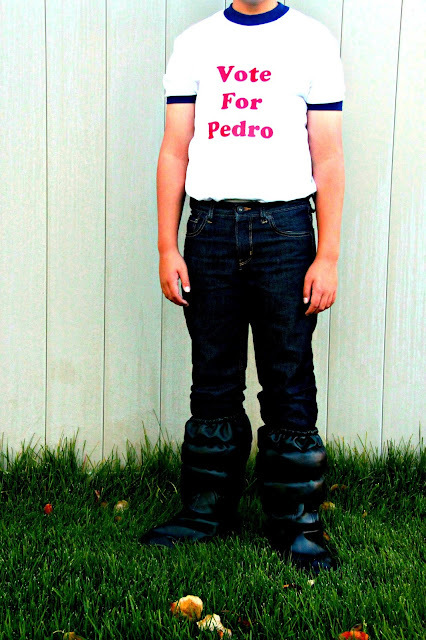 When they came, the boys immediately put them on. Do you know what they did next? They went off running. Then they got on their bikes. Then they got out the football. All they wanted to do was run around and be active. Win! 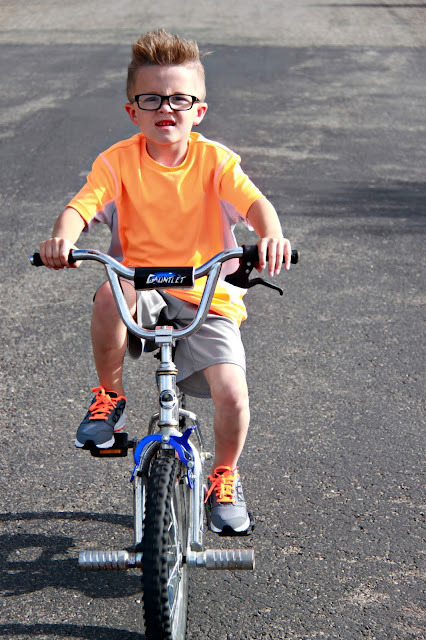 JCPenney not only has shoes, but they also have tons of great activewear for your kids. You can find a great selection online or at your local store. We obviously really like the selection of shoes. I know it sounds cheesy, but outfitting your kids in great activewear really does make them excited to be more active. 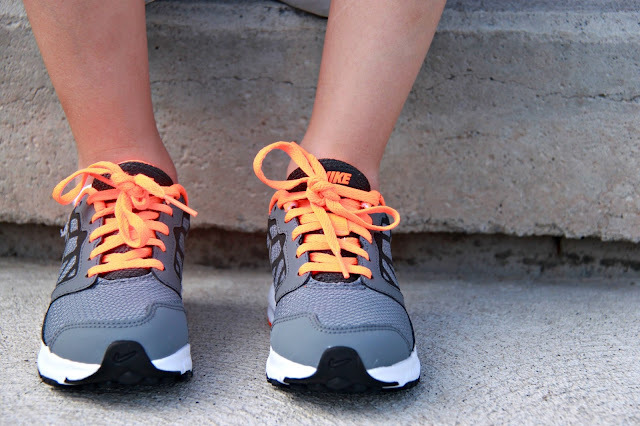 Good activewear, especially shoes, is also better for them as they play sports. 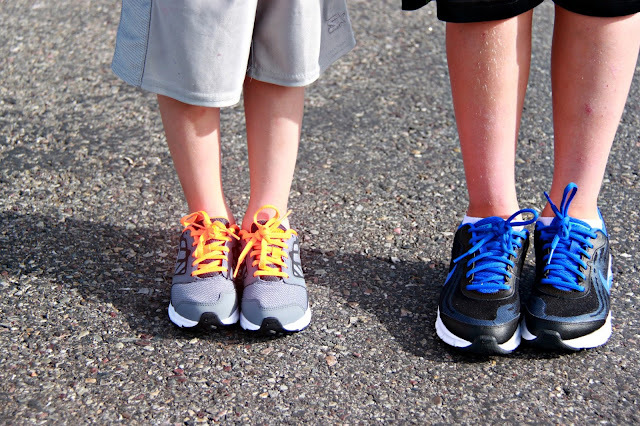 Encouraging my kids to be active has helped them have healthy habits. I have found that these 5 simple things have helped me as a parent encourage my kids to have an active lifestyle. Is there something that you do to help your kids be active? 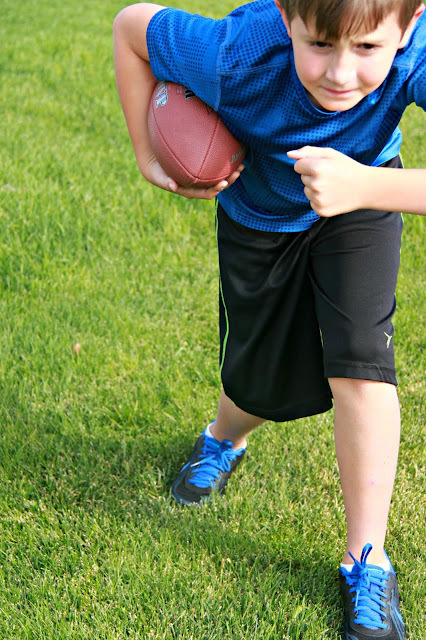 Leave me a comment and tell me what you do to help your kids be active and you will be entered in a sweepstakes to win a $100 JCPenney gift card. Every Fall something momentous happens. Soups get introduced back into our menu. I feel like every Fall when this happens, I gush and gush about my love for soups. I then in turn talk about how my family (curse them) do not love soup as much. It really is uncool. Well I am not going to talk about that this Fall. 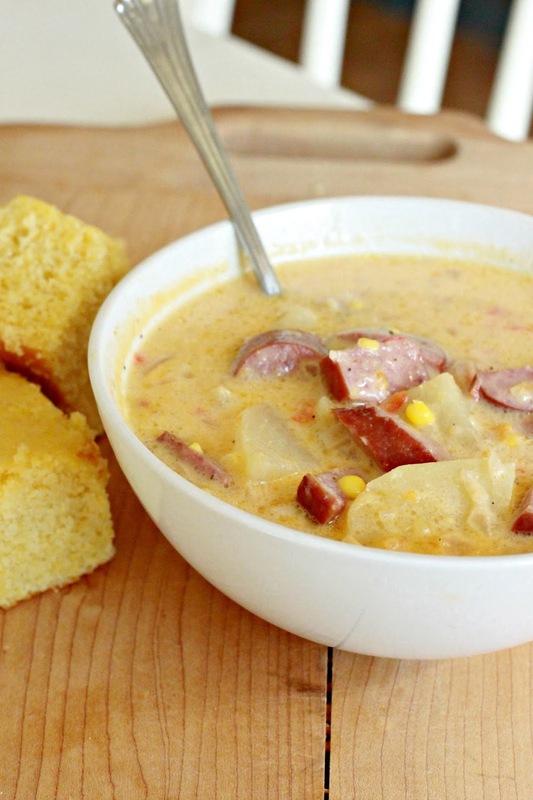 I am just going to talk about this oh-so-good Potato Cheddar Sausage Soup. First, it is a soup. Second, it is made in the slow cooker. Might I just add, welcome back Slow Cooker Saturday (at least for this week. Wink. Wink.). 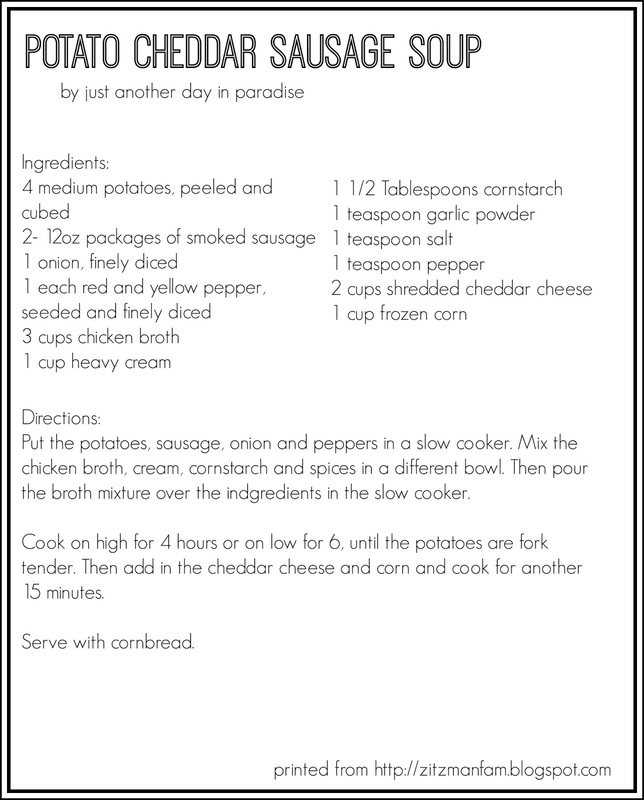 Everything but the cheese and the corn goes into the slow cooker and it just sits there and makes your house smell awesome all day. I love when a soup is light and hardy all at the same time. Sometimes chowders feel too heavy, but my boys don't always appreciate a broth heavy soups, you know because they are strapping young men and all. 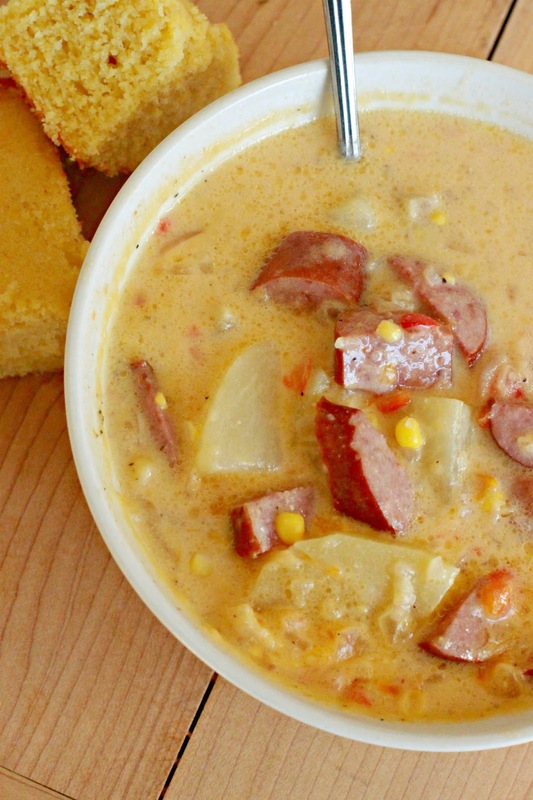 This Potato Cheddar Sausage Soup is the perfect happy medium. Happy soup making weather! Er, uh, I mean happy Fall. 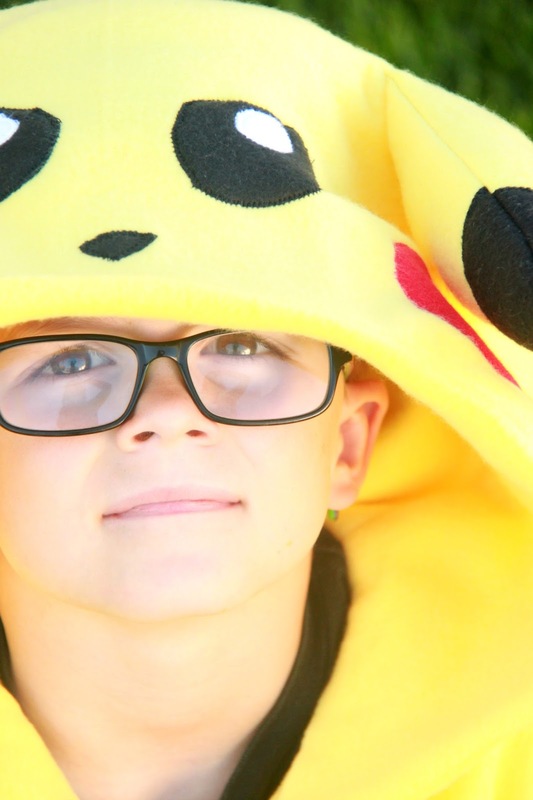 There was a lot of debate over this Pikachu Halloween Costume. Like a lot, A LOT. When Mister Little requested this costume, I was not on board. After all, we barely watch this show and we don't own any Pokemon merchandise. So I was a little surprised and a lot hesitant. I mean, seriously there are a million other things that would have been cuter. I spent several weeks trying to convince him that other things would be cooler. Alas, his mind was made up. Since I had said that they all could choose what they wanted to be, I had to surrender. 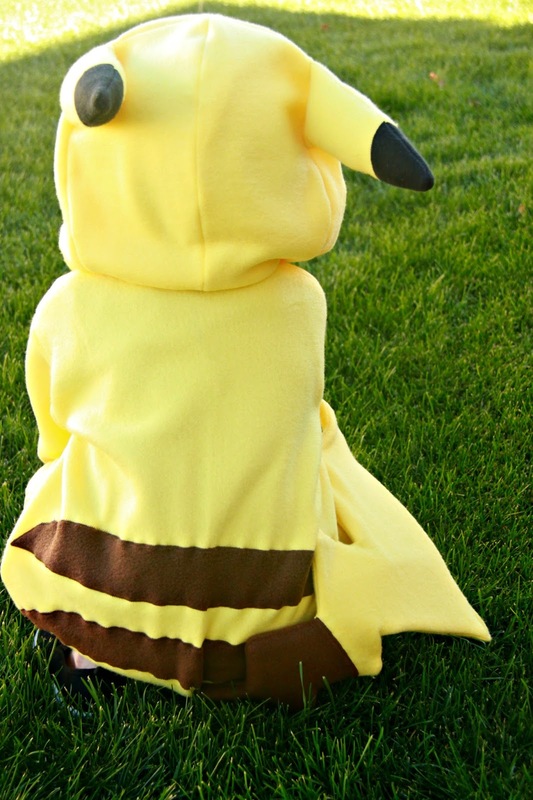 So the second installment of our no-theme Halloween is this Pikachu costume. I used the same pattern I used for Daniel Tiger. 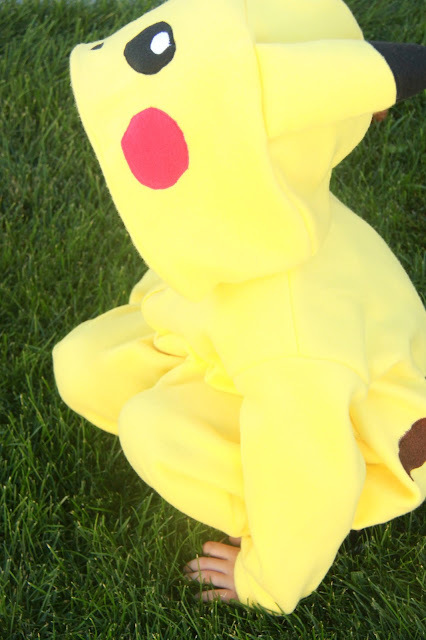 I changed the pattern to make it Pikachu. 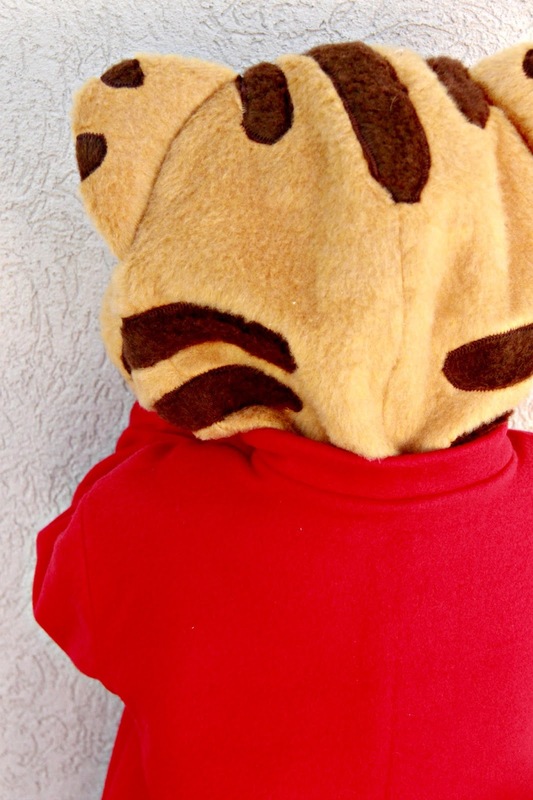 I appliqued fleece onto the hood to make his face. I added fleece stripes to the back. I altered the ears and the tail. In order to make the tail more sturdy I used a heavy fabric stabilizer. I also hand stitched part of the tail to the costume so it would stay in place. I used fleece for this whole costume. He will be so warm and cozy on Halloween night. 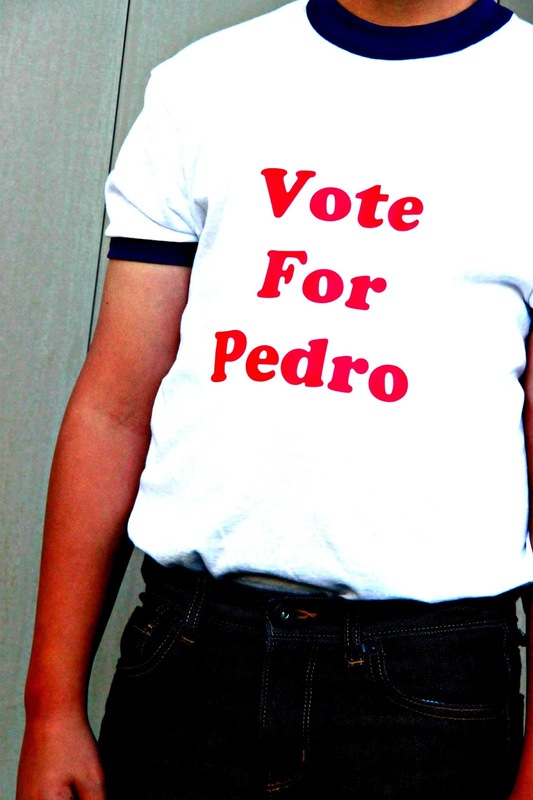 I don't know why I fought him on this costume. 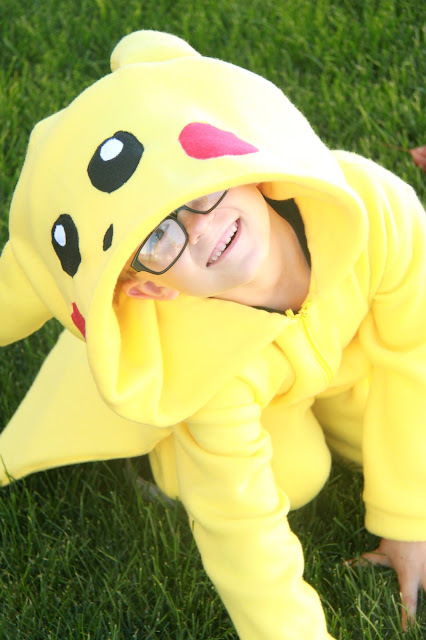 It turned out really cute and he is SO very happy. Two more costumes and this no-theme Halloween of 2015 will be done. 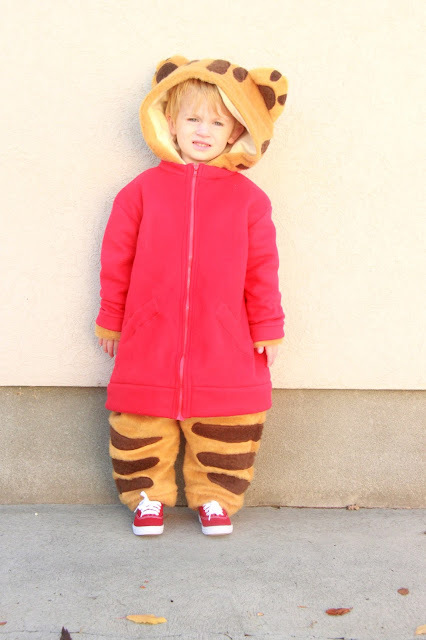 Daniel Tiger in Halloween costume form. Could there be anything cuter? 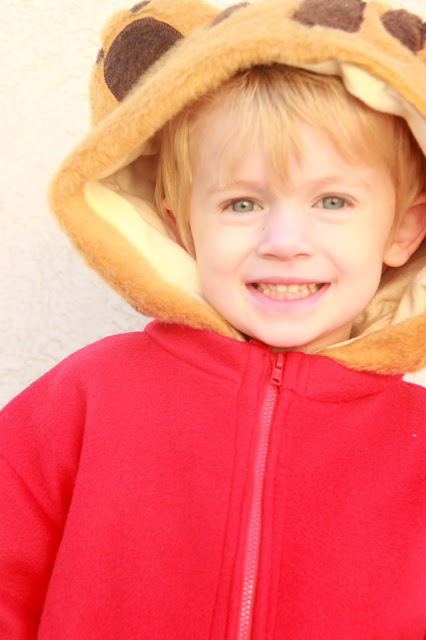 This boy LOVES himself some Daniel Tiger. 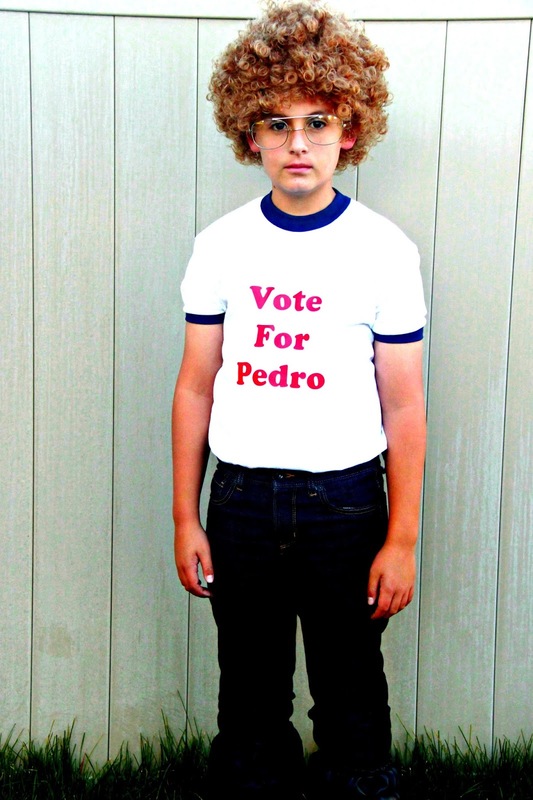 I have known for months this would be his costume. This year we had a bit of a different situation with Halloween costumes. I figured with two older kids, asking them to somehow fit a theme that includes Daniel Tiger wasn't very practical (or nice). So no theme. If you follow me on Instagram (@larissa_anotherday) you might already know what some of the other costumes are. None of them going with each other. 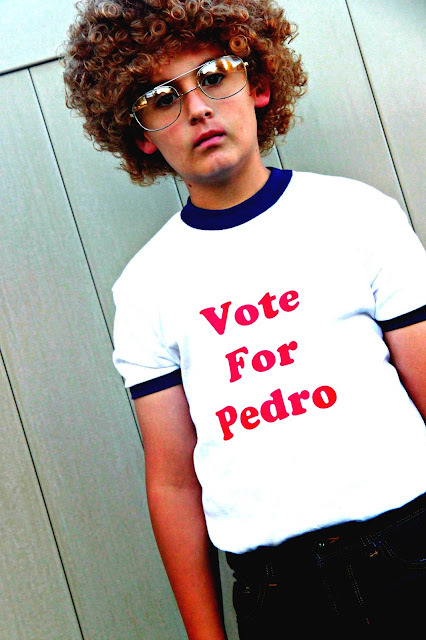 Enough about all the no themed costumes already. 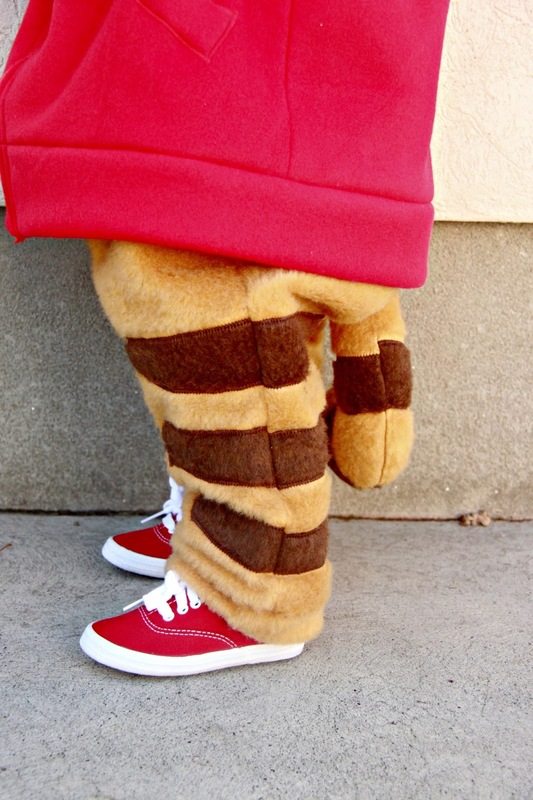 Let's talk about this Daniel Tiger. I started this costume with a basic pattern. I used the Simplicity 1032 pattern. 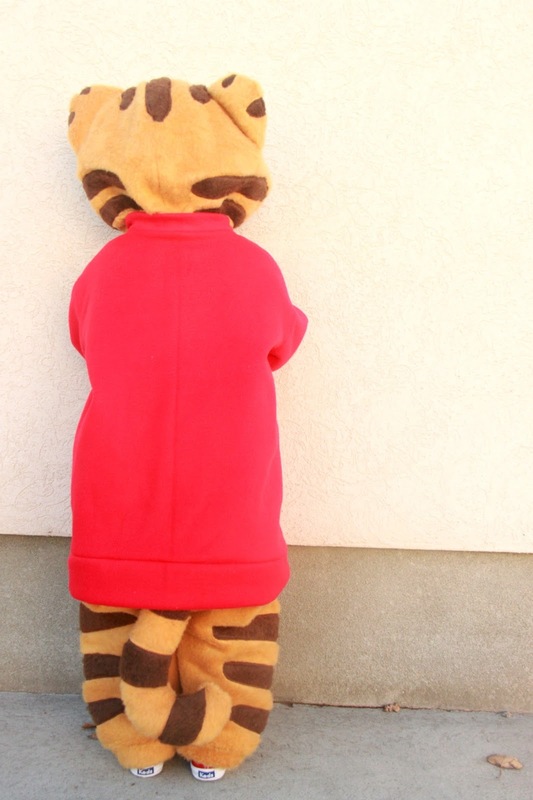 It is a basic jumpsuit with a hood animal pattern. In order to make Daniel, I had to alter the pattern a bit. I added strips onto the hood, ears, legs, and tail. I used the pattern's cat instructions, but I rounded the ears. Daniel Tiger also needs his red sweater. I roughly used the pattern to make a sweater. I added applique pockets, a collar, and a jacket zipper. The pattern does seem to run a little big. This was a size 3T and it is obviously HUGE on him. No worries though, it just makes him more cozy. He loves it, so I love it. He is so cozy and so cute! I really cannot get over it. 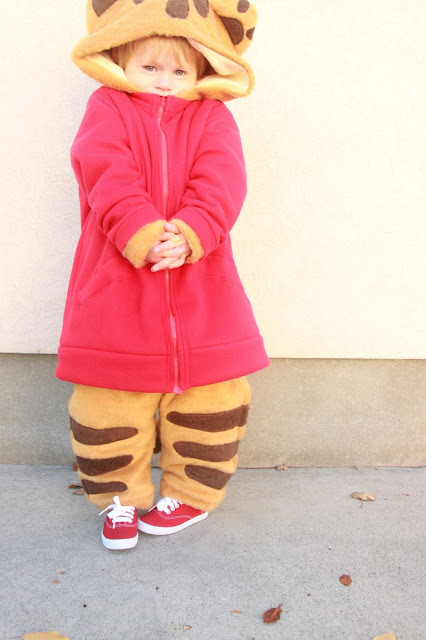 It will be a beautiful day in the neighborhood and a beautiful day for this Daniel Tiger neighbor. No doubt. Come back tomorrow to see the next costume. Ooh so exciting. I woke up this morning at 5 am and was reminded again, that while I can and do bake, I don't really love it a whole lot. I am not sure what it is. Upon reflection, there might be a couple of reason. Like boy does it make a mess. I also find if I bake, then I eat it. No bueno! I am also not naturally very exact in the kitchen. Which if fine for cooking, but not so much for baking. This was all made very clear this morning when I was making donuts from scratch for Mr. Middle's birthday. Since our favorite donut shop is closed on Monday, I figured I would make him some donuts in the wee hours of the morning. They were super yummy. They really were. Now I am just a little tired, my kitchen is less than immaculate, and I have way too many donuts just laying around begging to be eaten. 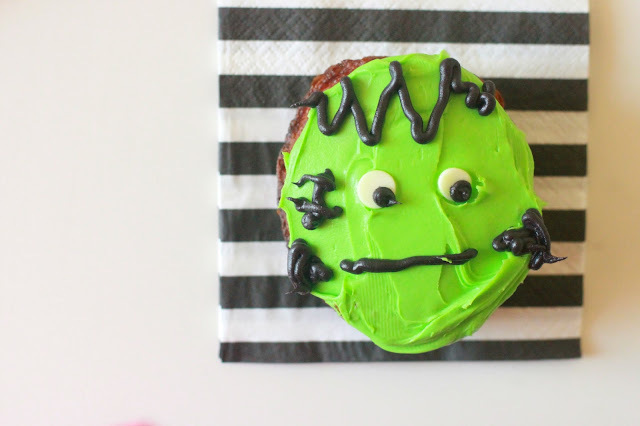 So why am I lamenting about baking during a baking post? 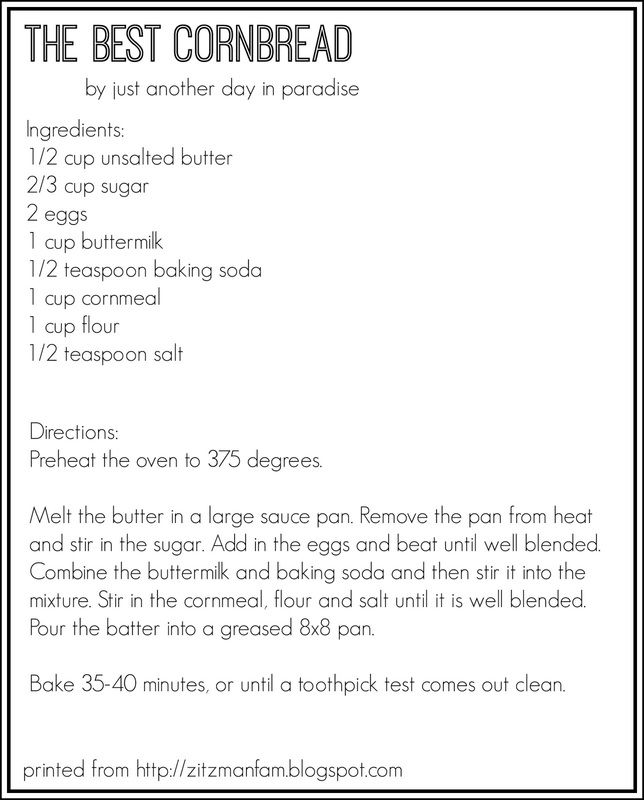 This is the way I figure it--if I do bake it and I do love it and I would bake it again, then I must share it. 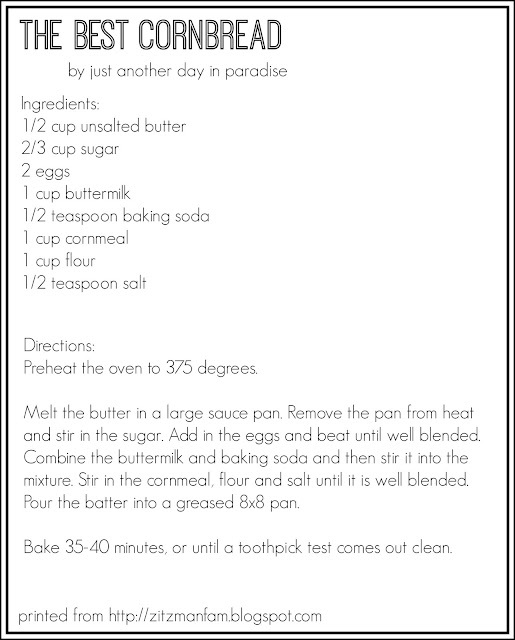 Also, that is assurance to you that this recipe is worth your time. 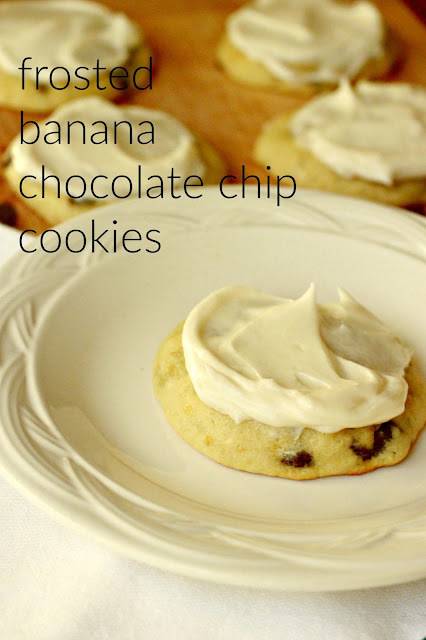 While I don't bake a lot, I absolutely jump on board for baking anything with banana. We love banana bake goods. LOVE them. We very rarely have bananas left over, but when we do we bake with them. 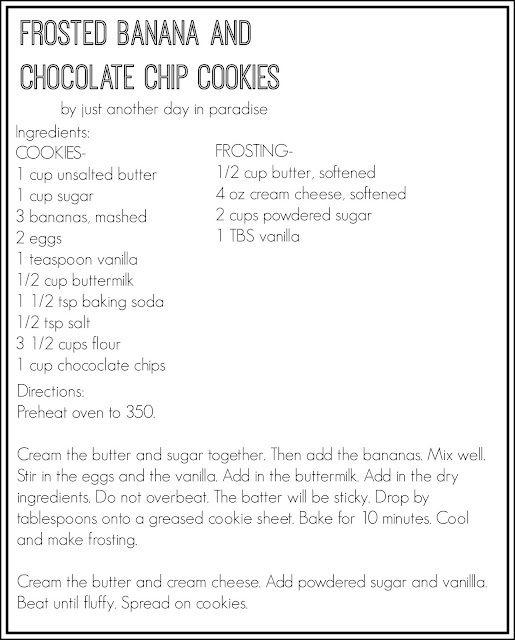 Our absolute favorite are Frosted Chocolate Chip Banana Bars. So it stands to reason that we would in turn love something like that in cookie form. 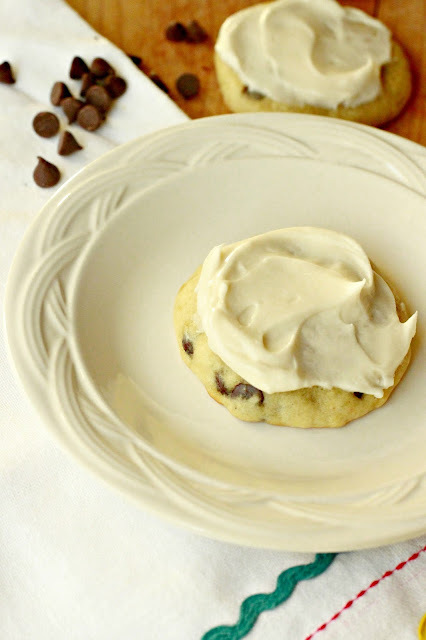 Man these Frosted Banana and Chocolate Chip Cookies are delightful. They are not dense like like a bar, but they are soft and fluffy (IT'S SO FLUFFY!!!). 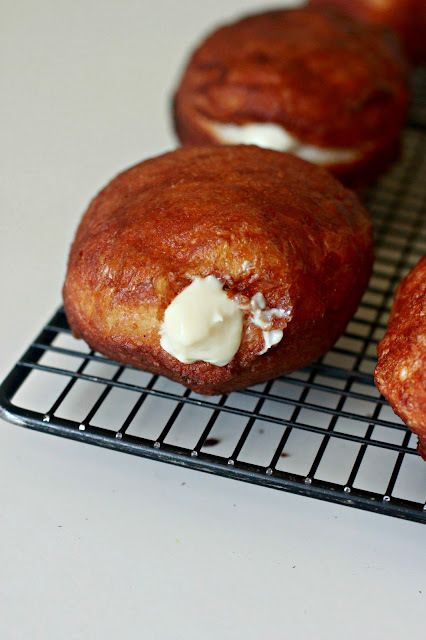 The frosting is light and perfectly cream cheesy. 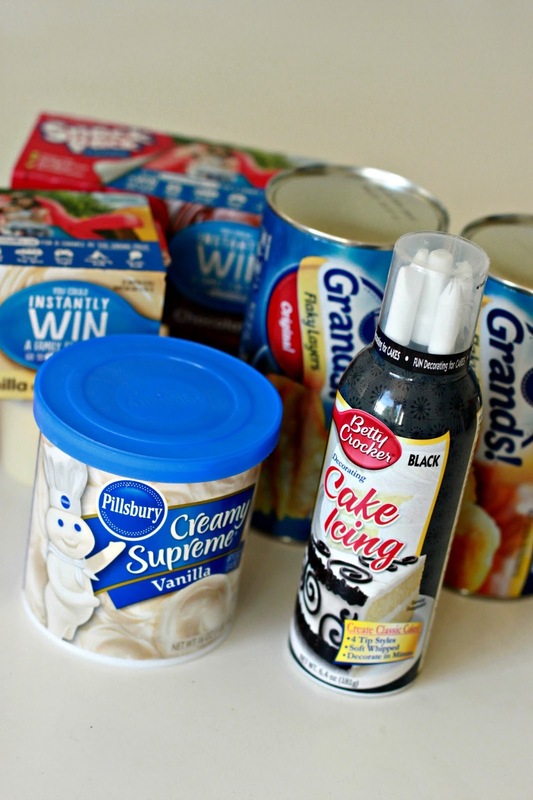 Who doesn't love a good creams cheese frosting? These cookies were easy to make, and just as important they were easy to share. Sharing is good because it insures I don't eat a dozen cookies all by myself. 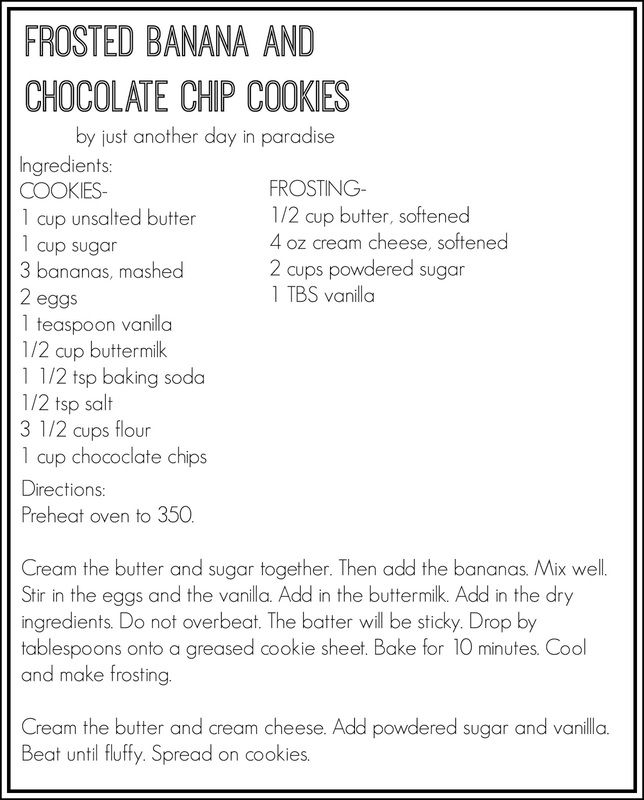 If you find yourself with very ripe bananas, then I think it would be delightful idea to make these cookies. You won't regret. Either will your neighbors. Wink. Wink. Sometimes I get an idea in my head and I just can't get it out. I was driving on one of my many errands. I was thinking about donuts, because well I like thinking about donuts. Then I was thinking about Halloween, because I am in the middle of making a small army of costumes. 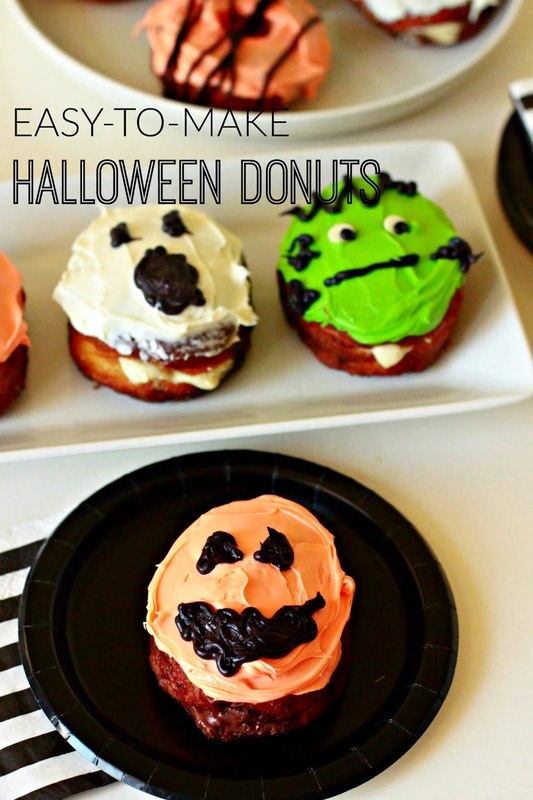 Then I thought about round donuts, which led me to think about Jack-O-Lantern donuts. Then I was all like, "I should make some of those." To which I was like, "with what time?" From that conversation I was reminded how easy it can be to make donuts if you use pre-packaged biscuit dough. Before I knew it I was dreaming up other Halloween donuts and I was stopping by the store to get the ingredients I needed. Guys! These were SO, SO easy to make. They are so stinking adorable. My boys were pretty impressed with them, I decided not to divulge how easy they were to make to them, but I will to you. I am nice like that. Heat the oil. Fry 2-3 biscuits at a time. Fry for 1 minute on each side. If they are cooking too fast (outside done, inside gooey), lower the heat of the oil slightly. Remove from the oil and dry on a layer of paper towels. Then remove to a cooling rack and cool completely. Once they are cooled. 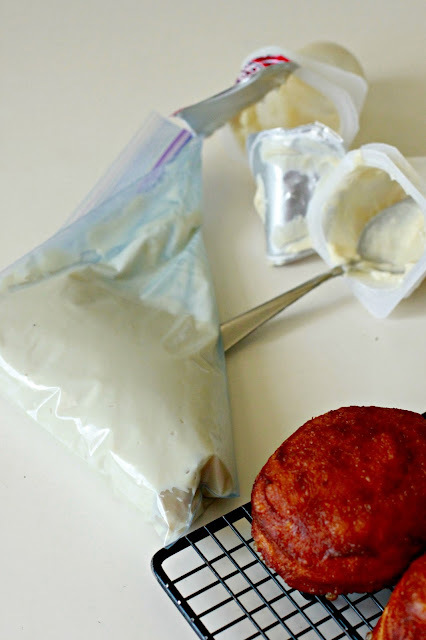 Remove the pudding from the cups into a plastic sandwich bag. I like to use sandwich bags as disposable piping bags. It is easy to clean up. Remove the air from the bag, seal, and position the pudding toward the bottom corner of the bag. Cut the corner of the bag to create a piping opening. With a butter knife, make a small opening in the donut. Put the end of the bag into the whole and slowly squeeze in the pudding filling. After that it is time to frost. The sky is the limit really. I split up the frosting into three bowls. I kept one white, dyed one orange and one green. Then I frosted each donut. 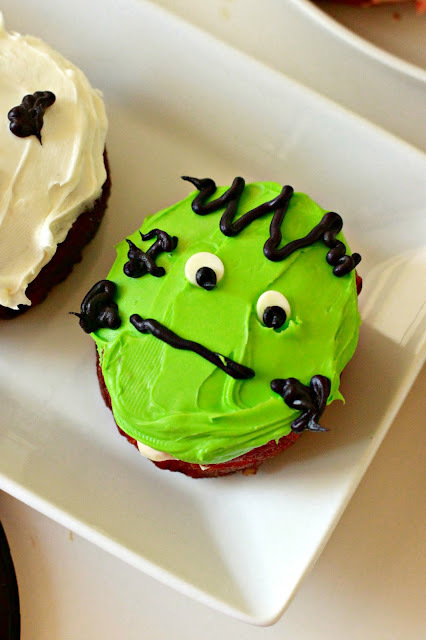 For the Frankenstein ones I added white chocolate chips and then embellished with the black icing. 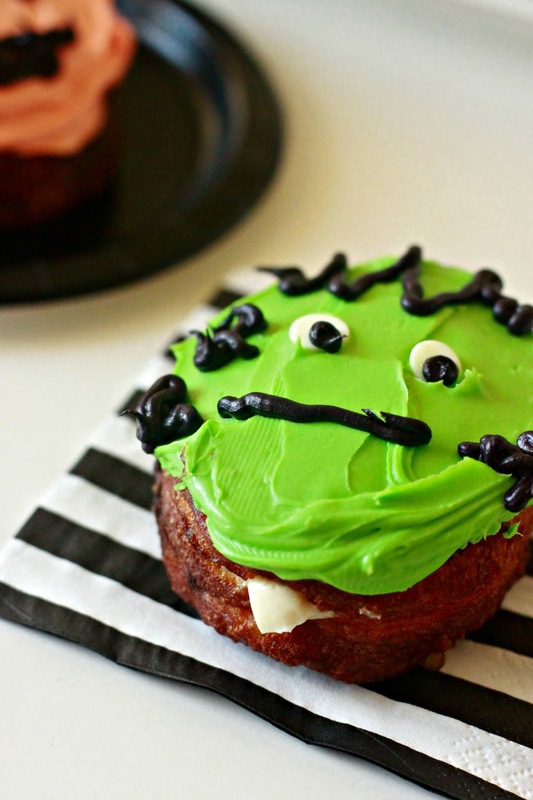 The Ghost ones I simply piped on a big scary boo mouth and some eyes with the black icing. 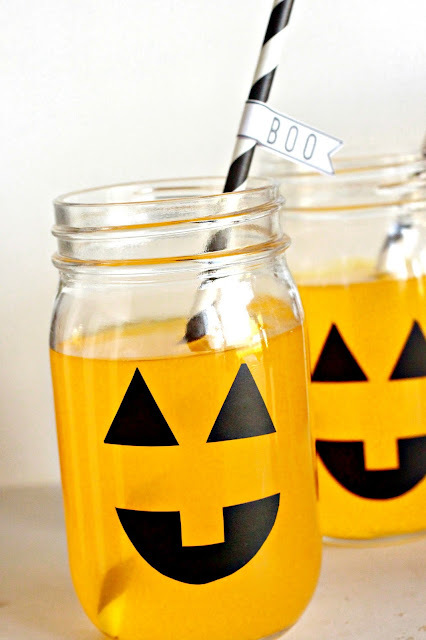 I did the same thing with the Jack-O-Lantern ones except with squiggly mouths and triangle eyes. Bam. They are done. Seriously SO easy. SO cute. 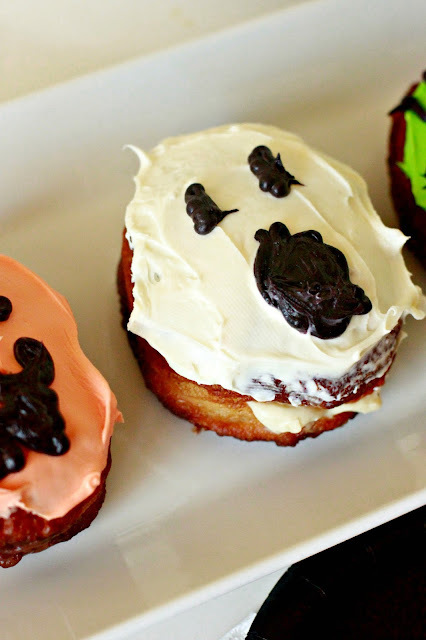 These donuts were such a hit in our house. One of my boys thought they were better than store bought donuts. Well, I don't know about that, but I will take the compliment. 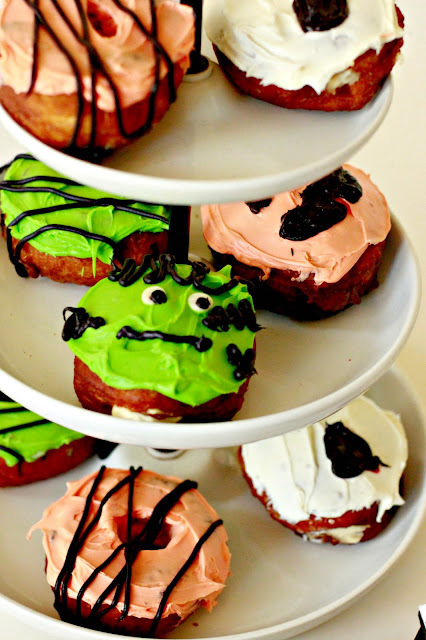 These would be perfect for a Halloween breakfast or a class party. Have fun!